(Nanowerk News) Researchers at the University of Illinois at Urbana-Champaign have introduced a new class of light-emitting quantum dots (QDs) with tunable and equalized fluorescence brightness across a broad range of colors. This results in more accurate measurements of molecules in diseased tissue and improved quantitative imaging capabilities. "In this work, we have made two major advances--the ability to precisely control the brightness of light-emitting particles called quantum dots, and the ability to make multiple colors equal in brightness," explained Andrew M. Smith, an assistant professor of bioengineering at Illinois. "Previously light emission had an unknown correspondence with molecule number. Now it can be precisely tuned and calibrated to accurately count specific molecules. This will be particularly useful for understanding complex processes in neurons and cancer cells to help us unravel disease mechanisms, and for characterizing cells from diseased tissue of patients." "Fluorescent dyes have been used to label molecules in cells and tissues for nearly a century, and have molded our understanding of cellular structures and protein function. But it has always been challenging to extract quantitative information because the amount of light emitted from a single dye is unstable and often unpredictable. Also the brightness varies drastically between different colors, which complicates the use of multiple dye colors at the same time. These attributes obscure correlations between measured light intensity and concentrations of molecules," stated Sung Jun Lim, a postdoctoral fellow and first author of the paper, "Brightness-Equalized Quantum Dots," published this week in Nature Communications. "The capacity to independently tune the QD fluorescence brightness and color has never before been possible, and these BE-QDs now provide this capability," said Lim. 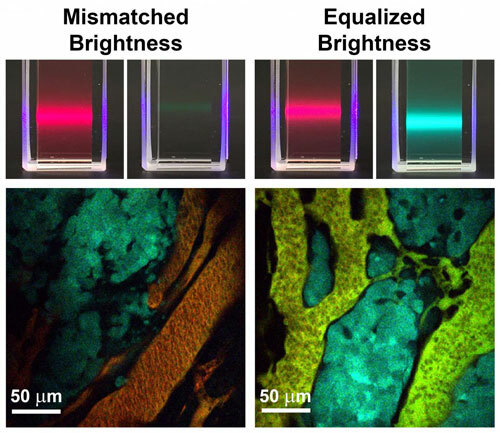 "We have developed new materials-engineering principles that we anticipate will provide a diverse range of new optical capabilities, allow quantitative multicolor imaging in biological tissue, and improve color tuning in light-emitting devices. In addition, BE-QDs maintain their equal brightness over time while whereas conventional QDs with mismatched brightness become further mismatched over time. These attributes should lead to new LEDs and display devices not only with precisely matched colors--better color accuracy and brightness--but also with improved performance lifetime and improved ease of manufacturing." QDs are already in use in quantum dot display devices (e.g. Amazon Kindle and a new Samsung TV).